Just over Christmas period a new certification hit Webassessor – the Nonprofit Cloud Consultant. Sadly I wasn’t one of those who were invited into the beta, so it was first thing on my list for January. 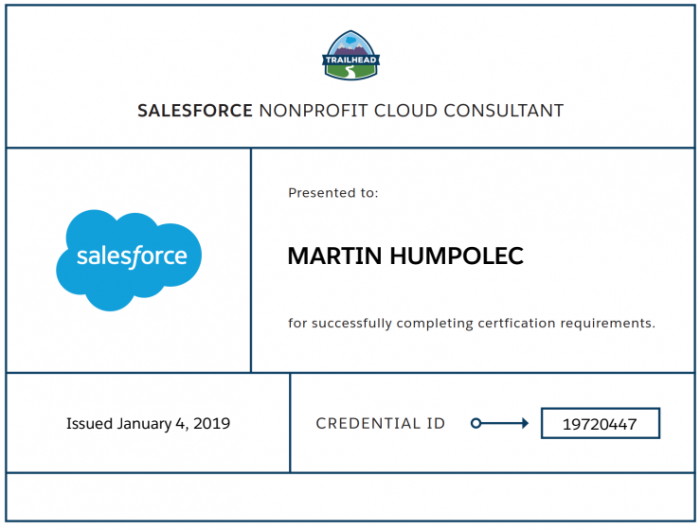 It is really great to see this exam, as it shows the importance of NPSP and that Salesforce is really dedicated to support nonprofits. And the exam isn’t about NPSP only but there are links to other products useful for NGOs as well. Actually, I was a bit surprised it spoke about Pardot and Marketing Cloud only, I can imagine that Einstein Analytics would provide a great value as well, not mention Communities or Quip. And platform, that awesome thing under everything! For a long time I had a feeling that NPSP is community effort with a few people working on it in their spare time. Later I’ve been told there are a few hundreds developers inside Salesforce(.Org) working on it as their daily job. This package – or rather several managed packages – sits on top of regular Enterprise Salesforce, provides functionality tweaked for NGOs use and is update every two weeks. Which is pretty awesome and at the beginning it scared me, but then they told me it is probably better, as they add a feature or two every 2 weeks, which is easy to set up and deploy. Way easier than to go through 500+ pages every 4 months as with standard Salesforce. Engagement Plans – pretty impressive automation and maybe even „project“ management you can use right out of the box. donations is the most important part of NPSP for most NGOs. I love how they though about the ability to forecast donations, which is something I didn’t see any of my organisations doing, I love the hard/soft credit idea and matching gifts implementation. With 35 000+ NGOs using Salesforce worldwide it is really great to see this certification on the market. The only „sad“ part of it is, that you are able to pass it with only standard Salesforce knowledge, which feels sad to me, as I know people who just hate NPSP and their first step in any NGO’s implementation is to remove it, instead of trying to understand what it does and how it works. And they being able to deliver even better implementation. Would you like a great list of topics to learn, here is a dedicated page full of links to other resources. Congrats Martin! I’ve actually been digging into NPSP myself as my first „real“ SF project. So far I’ve been focused on a data import challenge so I’m getting a lot of experience with the NPSP Import object. Didn’t realize there was a special certification for this so thanks for posting. It is brand new, great to see than the „other“ clouds get certifications as well. Einstein Analytics should follow.